In the morning of 11 April 2012, the sirens in the Indonesian city of Banda Aceh sound their sinister warning – tsunami alarm. Announcements are urgently made over loudspeakers, radio and television interrupt their programmes, and mobile phones signal alarms via SMS. Inhabitants and tourists quickly leave the beaches, while rescue teams initiate the evacuation. The earthquake that shakes the seabed off the coast of Sumatra on this day is one of the most powerful since the beginning of seismological recording. The locals had to tremble for three hours on that April day, and then the officials announced the all-clear. It was only due to a fortunate geological coincidence that the powerful earthquake did not trigger a tsunami. Yet the area-wide evacuation served as a confirmation that the early-warning system had worked – and that it can save thousands of human lives in an emergency. It is an ingenious system that was developed by geo-scientists, oceanographers and IT experts specifically for the conditions in the Indian Ocean. More than 160 seismometers distributed through the entire country, as well as GPS satellite sensors constantly provide real-time data; in addition to that, we have tide-gauge stations along the coast and on the offshore islands to monitor the sea level. The data all flows into a specially-designed warning system in Indonesia’s capital-city Jakarta. Scientists there monitor the Indian Ocean day and night – the high-tech headquarters represent the centrepiece of the early-warning system with the name “German-Indonesian Tsunami Early-Warning System” – abbreviated GITEWS. The technology is precisely configured to detect tsunamis as they occur; they are almost always activated by a strong earthquake on the seabed. Two tectonic plates come together off the Indonesian coast; the Indo-Australian Plate is slowly creeping several centimetres underneath the Eurasian Plate every year, which repeatedly results in strong earthquakes. A dense network of earthquake-stations thus forms the core of the early-warning system. The seismometers are distributed in such a manner that an earthquake can be detected within two minutes by at least three stations. The more precisely the staff at the warning-centre can identify the location and strength of the earthquake, the better they can predict when and where a tsunami could arrive. But not every strong earthquake automatically generates a tsunami as its consequence. The data from the seismometers on their own cannot provide information whether or not a tsunami will occur. By means of GPS, the warning system therefore receives additional information regarding the direction in which the seabed is shifting. It is only when the seabed actually rises during an earthquake that it displaces the mass of water located immediately overhead. A tsunami consequently spreads out in the form of a ring on the surface of the ocean. Conversely, if the seabed merely shifts to the side, the wave fails to appear – this is why the earthquake off the coast of Sumatra in 2012 turned out to be so harmless. Every alarm is nerve-racking for the staff at the warning centre; in the event of an earthquake, there are only five minutes before an evacuation is initiated, if it is necessary. The geology of Indonesia allows very little leeway, because within just 20 to 40 minutes after a quake the first tsunami waves can reach the main islands in the country, not to mention the numerous offshore islands. This is why project leader Jörn Lauterjung and his colleagues made only limited use of their access to the technology of other early-warning systems in the Pacific. On the island of Hawaii for example, it usually takes several hours before the tsunami reaches the beaches after an earthquake. “In Indonesia, on the other hand, officials have to decide very quickly and with limited data whether an evacuation should or should not take place”, explains Lauterjung. Because the lives of hundreds of thousands of people could depend on the decision, there is a clear maxim for the employees on site: “For all warnings with uncertain data, the worst-case-scenario has to be assumed”, says Lauterjung. It is impossible for the employees to evaluate all of the data in an emergency, since that would take several days. So that they can nevertheless make decisions as precisely as possible, Lauterjung and his colleagues have designed a so-called Decision Support System. The core of the system is comprised of simulations; more than 3,000 model calculations with multiple scenarios are available in the data base. A computer compares the current readings with these models; thus it is able to ascertain lightening-fast which of the pre-calculated scenarios best corresponds to the reality of the situation. The technicians are then able to base their decisions on this information. But despite the previous success of GITEWS, Jörn Lauterjung is aware of the limitations of the tsunami prognoses; ”Even if an early warning system is incredibly sophisticated, fatalities will still never be completely avoidable.” Evacuations in Indonesia are extremely complicated, since the country consists of more than 17,000 islands with long coasts, and the roads are, in part, poorly built. This is why evacuation exercises take place annually, and people are trained in proper behaviour for a tsunami. A considerable contribution is offered by the employees of relief agencies. The international Diakonie Catastrophe Aid organisation, for example, works together with locals in high-risk tsunami regions to make precautionary measures and equips them with alarm devices. Flood-risk maps have also proven to be reliable, in which dangerous areas, escape routes and shelters are marked. 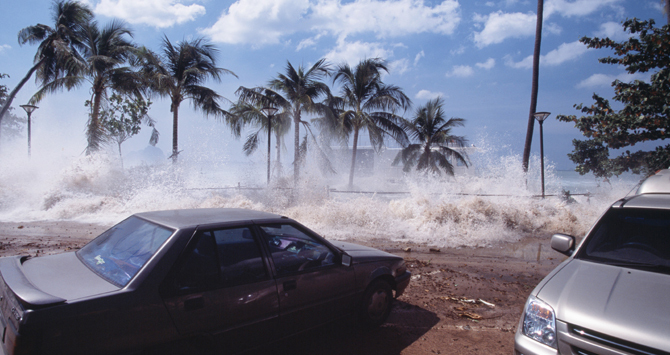 Inhabitants should be able to recognize early signs of a tsunami, such as retreat of the water, and initiate warnings and evacuation for other endangered citizens”, says Caroline Hüglin, who coordinated the Diakonie Catastrophe Aid project in Sumatra until 2007. Once people know how tsunamis work, this is the most effective protective measure because of the short window of opportunity after the warning signal – she is convinced of this.